Nowadays the number of brands is significantly increasing, but interchangeability is included in the daily schedule of change: some brands don’t work in specific markets and end to exist while simultaneously many new brands enter the markets. Contact to brands happens on a daily basis - consumers experience a plethora of offer and advertising of brands which is more and more getting an overtaxing and “oversaturation” to them. Purchase decisions are influenced by diverse complex factors and communication plays an increasingly important role. Not only social media and all manner of visual advertisements unconsciously do influence it but also verbal recommendations clearly leave its marks. But how does the positioning of brands works? The connection of the brand and its unique business model has to be sold and is more than decisive to achieve a strong and successful positioning. Currently not only one type of key customer dominates the markets but diverse target groups have to be addressed what more and more complicates the positioning process. which influence does culture has on the positioning of brands?  Is the procedure of advertising in different cultures the complete opposite? What is the deeper understanding of brands and positioning? What especially differentiates Cosmetic Brands? How does positioning created for a target group in a high-context culture differ from the one created for a low-context culture? 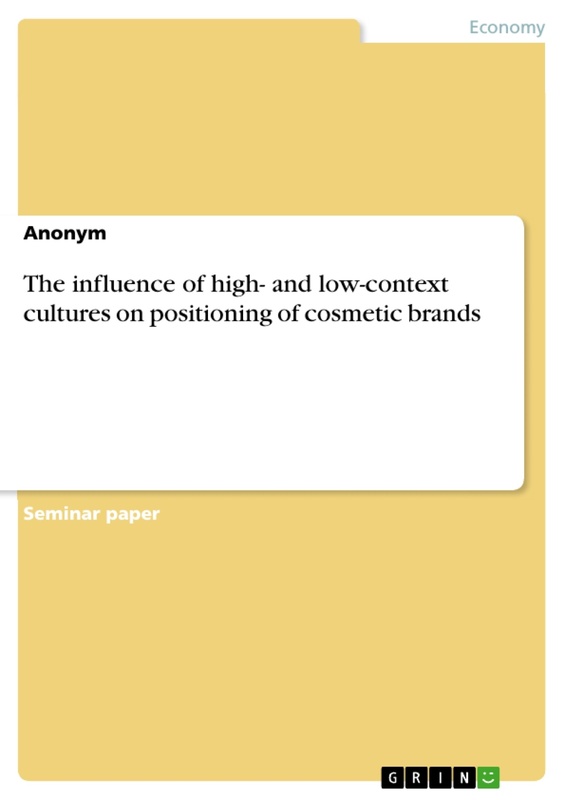 The research question focusses on the question if specific criteria of cultures in an anthropological culture concept influence the positioning of Cosmetic brands and if there is an existing correlation. The objective of this assignment is to show if there is a clear difference in positioning Cosmetic brands in the two different concepts of culture. In the theoretical part the object of investigation will be limited to the definition of the fundamental terms of “brands” and “positioning” and the concept of “high-and low-context cultures“ will be characterized. In the applied part the influence in each culture concept will be pointed out. The results of the assignment will be described in the summary and the outlook shows a possible future development of the topic. Due to the complexity of the whole topic each theoretical chapter is just a short summary of the most important points done through secondary research. In the applied part a small overview of the positioning in each culture concept will be given through internet research and be applied on the cultural communication. The influence of the positioning will be related to specific Cosmetic brands to deductively refer and generalize it on the totality of Cosmetic brands. The word brand has a wide range of definitions and a large number of terminology distinctions exist of which only a few will be mentioned. On the one hand a brand can just be seen as the labelling of a branded article to recognize the producer or provider of a product or a service. To define a product as a brand, it has to fulfill certain specified criteria or distinguishing features to concisely label the branded article. On the other hand a brand can be defined as the positive and distinctive image of a product, service, idea or even of people which takes over an identification and differentiation function for the customer and has an influence on the selection behavior through its orientation basis and assumed, consistent quality and performance. To explain the effect on consumers, the connected feelings and experiences to the brand also have to be observed and considered. The brands create feelings and images and are helping to distinguish and develop and convey the own moral concepts. Consumers can build up a more or less stable brand relationship through psychologically anchoring a unique image of a product or service. The brand name serves as an evaluation criteria and influences the perception of the product features. Moreover the value of a brand reflects itself in the consumer’s minds through the success factors fame, trust, sympathy, satisfaction and the connection to the brand. Those factors highly influence the financial brand equity concerning its sales volume and market share. In addition a consumer can see a brand as an “information chunk” of all linked associations with it. Brands can be divided in manufacturer brands and trademarks or in brand strategies as single brands (one product=one brand e.g. Ferrero Rocher or hanuta), a family of brands (e.g. Nivea can comprise different product groups) or umbrella brands (e.g. Siemens as the company being in the centre of attention). These brand strategies often don’t exist individually any more but are combined about which customers often aren’t directly aware. Manufacturer brands stand out with their unique range of services as selection criterion instead of the price. Trademarks often have a high market share through its cheap price, but have to be promoted more actively to establish themselves on the market. Even if trademarks are often appreciated more than classic branded articles and the consciousness of brand strategies slowly disappears, the differences between different kinds of brands become more and more blurred. To define the wide-ranged term of a Cosmetic brand, at first the term “cosmetics” should be defined. Historically the term “cosmetics” has developed over decades and has often changed its deeper meaning. Cultures and religion in addition already had a great influence on the process of formation of cosmetics. It is more than just personal hygiene or beauty care - the improvement in appearance of the body - it is also showing effects of cosmetics to the world concerning its visibility, fragrance or possibility to touch it. Moreover it is described as the result of a basis feeling of human beings. The current legal definition says that cosmetic means are substances or preparations of substances that are meant to get in touch externally with different parts of the human body as the skin, hair, nails, lips, teeth, oral mucosa and intimate regions. The purpose is the cleaning, perfuming, protecting, maintaining, changing of the appearance or body odour of the particular body part or even several mixed purposes. Nowadays cosmetics are more and more standardized and internationalized, environmentally friendly extraction and production as well as being harmless to health are more important than ever. Promoting and advertising them should be less misleading – proven ingredients and effects should be pointed out more clearly in future. Positioning is actively creating and developing a position of a brand in a target market and can also be described as the process of anchoring the image of a product in the consumers mind in a way that it attractively fulfills the ideal criteria to select the branded product which clearly stands out from the competing products. Moreover it can be defined as the anchoring of a value proposition - the so-called brand promise – in the consumers’ mind. An ideal realization of positioning is a complex process which can be reached by taking a special, appreciated importance in the customers’ mind which differentiates itself from the competitors. Positioning models are showing the perceived position of a brand, the ideal as well as the position of competitor brands. To successfully implement products or a new brand, a positioning strategy and also objectives have to be established. While entering into a market or repositioning, it is important to reduce the small gap between the perceived and as ideal considered characteristic values and current position of a product. If the position and characteristic values of the competitor brand are in addition “far away”, the purchase probability will be much higher too. It can be achieved by concentrating on either changing the product features, the brand perception or the ideal position in the market. Channel or tools to carry out a communication or advertising strategy could be for example the focus on the television commercials and creating a unique advertising proposition. Another well-known example is the Unique Selling Proposition which means a unique, distinctive and beneficial offer. In addition to that - and already indirectly mentioned above - the brand image as well as the brand identity play an important role to form a positioning strategy. A brand image - formed in the consumers’ mind consists out of the received, evaluated and memorized impressions of a product - can be reached by effective positioning, which is much more important than the existing product features. It is formed after a brand is established and can be seen as a long-lasting effect to the positioning activities of a company. The differentiated brand identity expresses which formative, strong characteristics a brand should represent and stands for - inside of a company as well as for the customer. In short it can mean a feeling of belonging to a brand. In different countries as well as different business segments the brand identity can highly differ and can have a high influence on the purchase probability. Market related aspects as for example the development of a market can quickly lead to an adaption of the brand positioning. To come back to the market leaders of Cosmetic brands one can say that as a market leader of a product it is much easier to establish competitive advantage concerning all kind of marketing tools as it is perceived as a brand product with a leading role through its image, the assumed quality and fame rather than its real sales volume. For the competitors the market leader limits the creation of a positioning strategy and can be seen as a reference with which they constantly have to compare themselves. To define different types of culture, a basis concept could be the cultural anthropological concept of Hall (1976) with its generalizing differentiation between high- and low-context cultures. It describes the way in which further knowledge of nonverbal communication, hierarchy and preview information of a culture (context information) is necessary or in which way verbal communication is sufficient to decode messages in these cultures. The classification serves as a tool to see and understand the differences of cultures through its different communication styles as well as cultural issues which include the differentiation between individualism and collectivism. Even if the cultural framework tends to be outdated, the communication patterns today still match with the cultural concept proposed decades ago. High-context cultures are mostly collective cultures such as Japan and China, but also Arab countries or Greece or Spain. In these countries, interpersonal relationships are long-lasting, deep and close and the communication in everyday life situations is carried out rapidly. Nevertheless the proposed dimension of the “message speed” is slow what means those cultures need more time to build up relationships. Slow messages are also for example books, TV documentaries and poetry or in general messages that take longer to act on and to be understood or deciphered. With regard to communication in general, it is influenced and determined by background knowledge and the situation itself inasmuch as statements are not explicit and the unsaid should be read “between the lines”. A “high-context message” is emphasized more by non-verbal signs or using silence than verbal ones and interrupting people or asking questions tends to be unusual. The “high-context” communication intensifies in case of a very close relationship through the mutually shared knowledge – deciphering of messages is expected by the listener. Moreover the communication style is determined by indirectness and nonconfrontational behaviour. Rational thoughts aren’t used even if the information in a conversation is given disordered, because it is assumed to be understood implicitly. Groups, to which someone has a high sense of belonging and identification, are strongly distinguished from groups without this feeling. The group is more the centre of attention than the individual which tends to be interdependent of others. The collectivism emphasizes values as for example training, physical condition or the use of skills and a high commitment and cohesiveness regarding people and what they say is an important key. In the business world superiors are feeling responsible for their employees – they are working for the common good. Agreements and contracts are made on a verbal basis; writing is mostly indirect and cyclically approached. Moreover Hall identified that high-context cultures have a polychromic time perception what means time isn’t in the centre of attention, things happen at an indistinct time. The behaviour is formed by culture and is difficult and slow to change. Low-context cultures are the cultures which highly emphasize the importance of individualism and the context information is mostly the other way round. Interpersonal relationships tend to be more temporary and loose and groups aren’t exactly distinguished. Individual achievements and accomplishments as well as independency are more emphasized than the group. The individualism emphasizes values such as personal time, freedom and challenge. The way of communication in texts or speech is very explicit because words and the content related to them are meant the way they are said. Statements are explicitly explained if the meaning is not understandable and feelings and intentions are also shown which correspond to the way of communication. It is not expected that everybody understands the values, group norms or in general has the same cultural understandings. The way of speaking is very direct and a plethora of words is used and in comparison to the high-context cultures it is courteous to also ask personal questions. Logic and rationality are the keys to solve problems, linear thinking is emphasized. The message speed is characterized as fast through quick contact making and fast messages such as headlines, TV commercials and prose. In the business world, responsibilities aren’t focused on superiors but within the administrative system and contracts and agreements are concluded in writing. Time perception is monochromic what means the cultures are time-orientated and planning and scheduling are important and efficient tools to advance from starts to deadlines. The cultural influenced behavior changes more quickly. Examples of low-context cultures are Scandinavian countries, German-speaking countries, North America or France. Many cultural aspects are gradually changing over time so it is possible that countries can be a mixture of both cultural concepts. Cf. Esch, F.-R., Brands, 2014, pp.69-76. Cf. Esch, F.-R., Brand management, 2014, p.18, 20, 22-24, 58; cf. Burmann, C. et al., Marketing, 2015, pp.325-326; cf. Bruhn, M., Marketing, 2016, p.144; cf. Esch, F.-R. et al., Marketing, 2017, pp.201-203; cf. Kramer, R., Comparative advertising, 2017, pp.11-12. Cf. Esch, F.-R., Brand management, 2014, p.21; cf. Bruhn, M., Marketing, 2016, p.144; cf. Esch, F.-R. et al., Marketing, 2017, pp.204-205, 212-214; cf. Kramer, R., Comparative advertising, 2017, p. 13. Cf. Umbach, W., Cosmetics, 2004, p.1. Cf. Umbach, W., Cosmetics, 2004, p.5, 7-8. Cf. 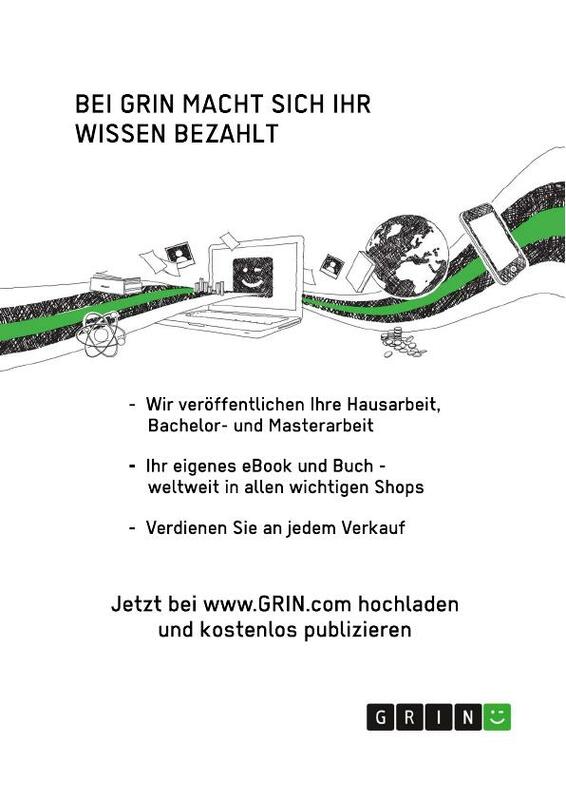 Esch, F.-R., Brand management, 2014, pp.125-126; cf. Burmann, C. et al., Marketing, 2015, p. 337, 575; cf. Bruhn, M., Marketing, 2016, p.67; cf. Esch, F.-R. et al., Marketing, 2017, pp.206-207; cf. Kramer, R., Comparative advertising, 2017, p.20. Cf. Esch, F.-R., Brand management, 2014, pp.126-128, 132; cf. Burmann, C. et al., Marketing, 2015, pp.337-338, 575; cf. Bruhn, M., Marketing, 2016, pp.67-68; cf. Esch, F.-R. et al., Marketing, 2017, p.147, 207-210; cf. Kramer, R., Comparative advertising, 2017, pp.20-21, 23-24. Cf. Esch, F.-R., Brand management, 2014, p.79; cf. Burmann, C. et al., Marketing, 2015, pp.329-330, 332; cf. Kramer, R., Comparative advertising, 2017, p.21. Cf. Esch, F.-R., Brand management, 2014, p.79, 141-143; cf. Burmann, C. et al., Marketing, 2015, pp.329-330, 332, 337; cf. Esch, F.-R. et al., Marketing, 2017, pp.205-206. Cf. Kramer, R., Comparative advertising, 2017, pp.20-23, 25. Cf. Nikitopoulos, A., Utler, A., Cultural differences, 2011, p.256; cf. Heringer, H., Intercultural communication, 2014, p.144. Cf.Nishimura, S. et al., High-and low-context cultures, 2014, pp.783-784. Cf. Würtz, E., High- and low-context cultures, 2005, p.276. Cf. Würtz, E., High- and low-context cultures, 2005, p.274, 277-280; cf. Heringer, H., Intercultural communication, 2014, p.145; cf.Nishimura, S. et al., High-and low-context cultures, 2014, p.785, 789. Cf. Würtz, E., High- and low-context cultures, 2005, p.274, 277-280; cf. Heringer, H., Intercultural communication, 2014, p.145; cf.Nishimura, S. et al., High-and low-context cultures, 2014, p.785. Cf.Nishimura, S. et al., High-and low-context cultures, 2014, pp.788-789.